Robert Snyder was born in Alabama on July 16, 1941. He taught at Glenbard East in the 1960s and 1970s and moved to New Orleans in 1978 and taught at a state school there. 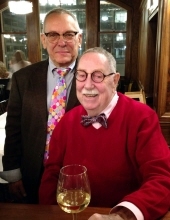 In 1990 Bob returned to Illinois where he had met the love of his life, Robert Schubert. They were married in Illinois in 2011, when the law finally allowed, but their commitment predates that by over 20 years. Bob Snyder then taught at Glenbard East until he transferred to Glenbard West in 1993, where he spent the rest of his career in the Special Education Department. He retired in 2002. His survivors are his husband Bob and two magnificent retired greyhounds, Tina and Reilly. Donations in his memory can be made to the Sunburst Project at the Greyhound Alliance [greyhoundallliance.org]. To send flowers or a remembrance gift to the family of Robert E. Snyder, please visit our Tribute Store. "Email Address" would like to share the life celebration of Robert E. Snyder. Click on the "link" to go to share a favorite memory or leave a condolence message for the family.